Everett and Snohomish County, less than an hour's drive north of Seattle, offer a lot of fun things to see and do. Scenic parks and trails provide incredible opportunities to spend time outdoors, enjoying Northwest nature, while other major attractions include the Future of Flight Aviation Center & Boeing Tour and the Tulalip Resort Casino—but that's just a fraction of what's on offer in this idyllic pocket of northwest Washington. Here are our 10 best recommendations for fun things to see and do in Everett and surrounding Snohomish County. Snohomish County is a hot spot for aviation buffs, whether you're interested in historic aircraft or the latest aerospace technologies. Boeing builds its wide-body planes, including the 747, at its massive facility at Paine Field in Everett, Washington. The Boeing factory tour has long been popular with Seattle visitors, and the Future of Flight Aviation Center opened in 2005, adding an interactive museum experience to the mix. Performing arts venues, sports arenas, cultural museums, and visual arts organizations are among the amenities that make life in Snohomish County so rich. Everett Performing Arts Center is among the most popular, and the performance schedule at this downtown Everett venue includes musicals, children's theater, and plays from the resident Village Theatre company. Visual art in all media is the focus of Everett's Schack Art Center. Visitors here can see exhibits, participate in workshops, or watch the activity in the working glass shop. Some of the best casinos in Washington State are located in Snohomish County, including the Tulalip Resort Casino, Angel of the Winds Casino, and Quil Ceda Creek Casino. Whether you stop by for a couple hours or a couple days, the Tulalip Resort offers high-quality hospitality across the board, You'll find the latest gaming machines and table games, fine and casual dining, and an awesome spa. Meanwhile, Angel of the Winds bills itself as "the world's friendliest casino." This Arlington complex is run by the Stillaguamish Tribe, and, in addition to gambling, Angel of the Winds offers great dining, a smoke shop, and an RV park. Located just south of the Tulalip Casino, Quil Ceda Creek is another facility operated by the Tulalip people. The fun includes slot machines, table games, and casual dining. Sports of all kinds are featured on the big screens throughout the gaming floor. 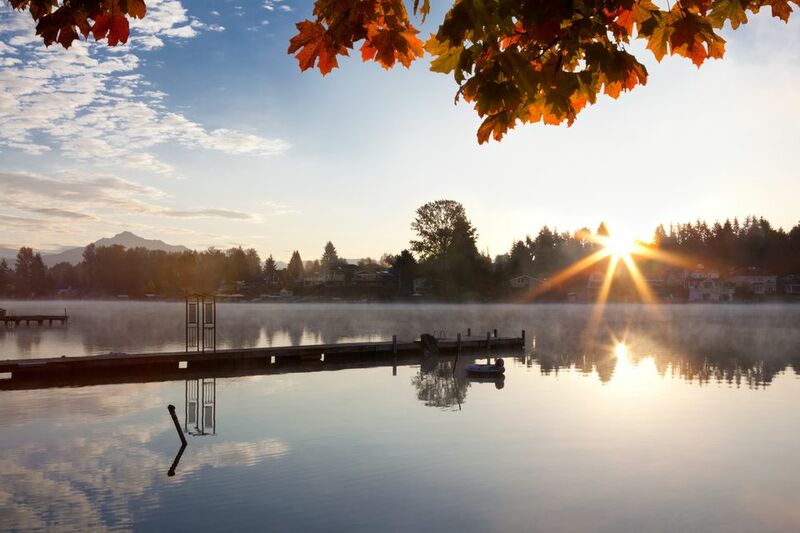 Snohomish County spans the shores of Puget Sound, the Snohomish River valley, and the forested foothills and mountains of the Cascade Range, making it one of the country's best spots for outdoor activities. The county encompasses urban districts, small towns, agricultural areas, and patches of wilderness. Outdoor recreation opportunities include beachcombing, hiking, camping, kayaking, boating, fishing, birding, and more. Start by kiteboarding off of Jetty Island, or lace up your hiking boots and hit the trail—there are more than 30 different hikes in the area, ranging from the 2.5-mile Big Gulch trail to the strenuous 18.6-mile Circle Peak trek. Visitors to the cities and towns north of Seattle will find some unique shopping opportunities. There are, of course, major malls with all the latest and greatest big box and high-end retailers, but bargain hunters will enjoy the premium outlet stores, and the antique shopping district in downtown Snohomish. The Antique Station at Victoria Village, with its two floors, is filled with furniture, tools, kitchenware, and loads of unique Western memorabilia. Located at Everett's Paine Field, the Flying Heritage & Combat Armor Museum features rare and historic military airplanes and other vehicles from around the world. Housed in a giant hangar, each aircraft is accompanied by informative artifacts and exhibits. Special events are held on a regular basis and include air shows and tours. The Tulalip Tribe is a significant presence in Snohomish County, and their reservation occupies a large section between I-5 and the Puget Sound. Learn about their culture at the Hibulb Cultural Center, which features interactive exhibits, artifacts, and games that children will enjoy. Hibulb is the most comprehensive look at Native American life in the Seattle area. The Everett Silvertips ice hockey team, a major junior team, play their home games at Everett's Angel of the Winds Arena, formerly the Xfinity and Comcast arena. Hockey season runs late September through March. The venue can seat up to 10,000 people and hosts performances and special events of all kinds, from ice skating shows and circuses to motorsports and big-name concerts. This rollicking festival, usually held mid-July, has been in existence for nearly 40 years. Founded by locals who moved to the area from North Carolina, it features the best bluegrass musicians from the area and nationwide. Prepare to camp out for a few days at the festival grounds, located along Whitehorse Mountain and the North Fork Stillaguamish River. There's no better way to get a view of the valley than from a hot air balloon. From a balloon ride, you'll be able to see the Cascade Mountains, downtown Seattle's skyscrapers, the Snohomish River, and Mount Rainier.